Does life reflect art or art reflect life? Capture and record the cultural influences that shape your personal history. One of the most treasured experiences of my high school career was the opportunity to play the role of Mary Lennox in my school’s production of The Secret Garden. I had previously read and enjoyed the classic book by Frances Hodgson Burnett, and developed a deep love for the characters and message as we prepared and performed. Though that experience was more than twenty years ago, I still continue to draw on the symbols and themes and powerful messages of both that story and my experience portraying it. How has your life been impacted by art or literature? What lessons still guide you today? Young Mary Lennox, orphaned in India, is sent to live with relatives in England. Unhappy and sour in her selfishness, she enters a household filled with despair and secrets of its own. But The Secret Garden is a story of transformation. Over course of time with help from within and without the dark Misselthwaite Manor, Mary begins to change. She finds there might be good and happiness in the world, and that perhaps she can embrace it and spread it. In the book, it’s called magic. As Mary begins to make progress bringing health and happiness and healing to her invalid cousin and the household in general, she is thwarted by the ignorance, fear, and selfishness of those who prefer stagnation over change and growth. Have you seen that in your life? Have you started to make progress, then been stunted, or your assistance to others is refused? How does it feel? How do you combat that negativity? Despairing at the barriers blocking her way, Mary counsels with Martha, the ever-cheerful housemaid who had first launched Mary on the path of vitality and independence through an artful combination of cajoling and obstinacy. Hold on to what you know is true. Hold on until you get through. Child, oh, child! It’s the storm, not you, that’s bound to blow away. That line, its meaning, has made a difference for me many times. It has helped me realize and remember that if I stand strong and steady to what I know- in parenting, relationships, work, trials, or life- whatever storm is tearing at me will eventually pass. I just need to hold on. 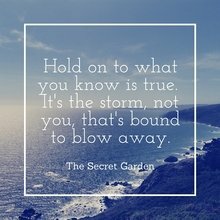 Remembering The Secret Garden helps me stand firm amid the buffetings of the wind and the waves of life. What music or art or literature or characters have influenced you for good? Come from up above or down below or just come flyin’ at you from across the room! Because it’s the storm, not you, that’s bound to blow away.